What is a VLAN Trunking Protocol (VTP)? VLAN Trunking Protocol (VTP) is a Cisco proprietary Layer 2 messaging protocol that manages the addition, deletion, and renaming of VLANs for the Cisco Catalyst Switches in the same VLAN Trunking Protocol (VTP) domain. VLAN Trunking Protocol (VTP) enables Cisco Catalyst Switches to exchange and maintain consistent VLAN information amongst a group of Cisco Catalyst Switches. For example, information for the VLAN 50 defined in Cisco Catalyst Switch A is propagated via VTP updates to all other Cisco Catalyst Switches (Switches B, C and D) in the same VTP domain, the other Cisco Catalyst Switches B, C and D will all end up adding VLAN 50 in their local VLAN data base. VTP is available on most of the Cisco Catalyst Family products. The comparable IEEE standard in use by other manufacturers is GVRP. The VTP domain consists of a group of logical group of Cisco Catalyst Switches that are part of the same VTP management domain. A Cisco Catalyst Switch can belong only to one VTP domain at any time. 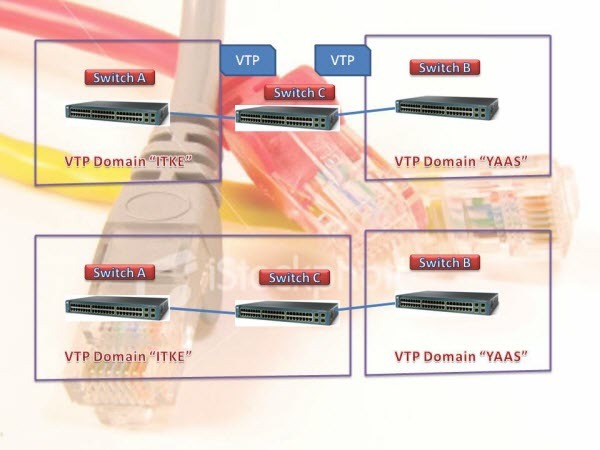 The VTP domain is a logical group of switches that will share VLAN information. Each switch can belong only to one VTP domain in addition to sharing the VLAN information with all other Cisco Catalyst Switches in the same VTP domain. Cisco Catalyst Switches in different VTP domains drops any VTP updates received from Cisco Catalyst Switches. 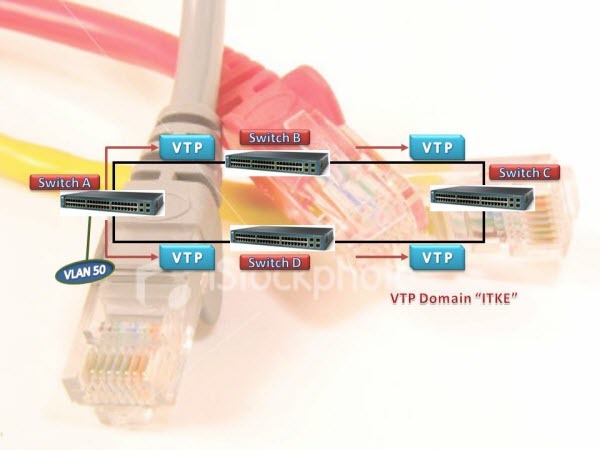 Switch C is added to the network connecting via a trunk port to Switch B with no VTP domain configured, in this mode when the Switch C receives the first VTP update from the adjacent Switch B, it will become the part of the VTP domain ITKE as identified in the VTP update. What do you think what happens? If a new Cisco Catalyst switch is placed between any two VTP domains, the Cisco Catalyst switch will join the VTP domain identified by the first VTP update it receives. Just check the following example. Whenever a change occurs in the VLAN database, the VTP server increments its configuration revision number and then advertises the new revision throughout the VTP domain via VTP advertisements. VTP Server: The default mode. When you make a change to the VLAN configuration on a VTP server, the change is propagated to all switches in the VTP domain. VTP messages are transmitted out of all the trunk connections. In Server mode we can create, modify, and delete VLANs. VTP Client: cannot make changes to the VLAN configuration when in this mode; however, a VTP client can send any VLANs currently listed in its database to other VTP switches. VTP client also forwards VTP advertisements (but cannot create VTP advertisements). VTP Transparent: When you make a change to the VLAN configuration in this mode, the change affects only the local switch and does not propagate to other switches in the VTP domain. VTP transparent mode does forward VTP advertisements that it receives within the domain. 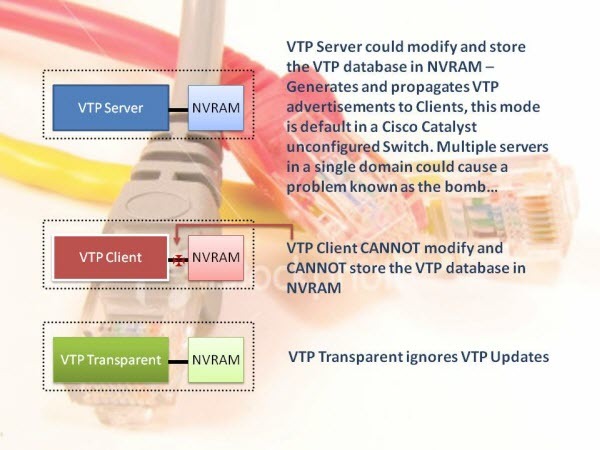 An official tutorial about VTP published by Cisco—Why we need VTP? How to Setup VLAN Trunking Protocol (VTP) on Cisco Switches? How to Configure IPSEC Encryption with the Cisco IOS?